We’re looking for feedback from our community around the new Experimental Drag features in Forza Motorsport 7. Let us know what you like, as well as what you might like to see changed in the future. Any and all feedback is welcomed. 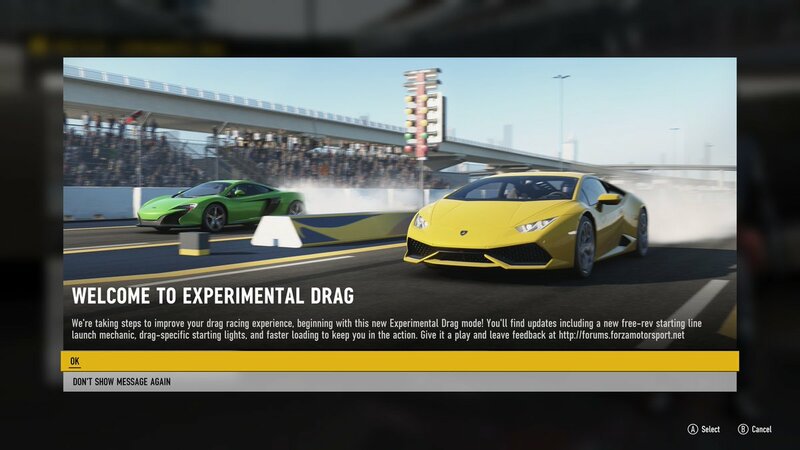 I get that it is experimental but is there any way we can get the other drag tracks other than Dubai in it? Every track is different and for good and proper feedback it might be a good idea to have the options for tracks. Considering what it is as of now I'm all for it! I think the credit/xp pay out should be a little more since it actually takes skill to cut the light. I'm happy with it the way it is at the moment. Add an info box always present on these screens which shows your Model, Division, Homologation (HP, Class, Tire), Aspiration, and Drivetrain for the car you're currently in. This is much more like it and a great step in the right direction! When this goes online, races will have a lot more about them than just who has the fastest car - some driving skill is now required! One huge thing though: Elapsed time, not total time, should be on the leaderboard. In real life, RT doesn't matter when setting a world/continental/track/personal record with the ET. Total time is only important when deciding who won a race. We now need a burnout box to heat the tires and we should have to stage our cars , I would also like to see the actual tree lights working. I'm downloading this now. Just got home from work. I will happily post up what I like, don't like and what is like to see different. There should be a track boundary in between the two lanes for sure. Cross the line - instant DQ, just like pulling a cherry. Also actual tree lights should actually work, as that’s where I would naturally look on the in-car view. 1/8th mile ET and MPH would be nice to have. Split timer on screen is useless info currently, it would be far more useful at the 1/8 than at the 60’ which also ties into above point. Liking it so far, though Dubai isn't really my favorite track. 1. Pre-race burnouts. Anyone that's been to a dragstrip can tell [you] that they're a key part of the experience. Getting a racer's tires up to optimum temperature so they can achieve the fastest times. 2. In conjunction with that, the ability to fit actual drag racing slicks onto the drive wheels of a given car. Yes, the game already has a drag racing compound, but that's always seemed, in my opinion, to be equivalent to a drag radial, which offers nowhere near the level of grip that a real slick does. *If this were to be done, I'd think the probably best way to implement it would be as a body kit, much like how the 32 5 window's allows for more extensive modification. Almost as rusty as the cars he paints. You should be running in the 7 to mid 8 of course it depends on car weight tune etc but you get where im going. This update is a great move in the right direction. Being a drag racer I've noticed a few things that could help bring out the authenticity of this mode. * A Pro-Tree lighting format option. This is essential in true heads-up racing, and challenges the racer to react instead of just timing the light on a regular tree. * Bracket/Index classes. This will add to the fun of building purpose built cars in the game. It will also allow new racers to be able to compete with each other more experienced racers on an equal playing field. These are just a few simple suggestions that I think would make a big difference in the final mode of the game. Don't think its a big deal right now being its only free play , But definitely needs to be addressed before it hits multiplayer you cross you lose period ! Bracket/index would be great. That would also allow any car to be competitive against another regardless of class, drive type or homologation. I also agree about the pro tree because the sportsman tree we have currently doesn’t fit with this heads-up format. I like the new drag feature. If there is going to be active drag racing and legit times 60ft and 1/4 times. A 2step launch control should be at least attempted. A way to build boost and control different rpm. Also taller tires (bigger slicks). And if we could be able to stage ourselves. I know it’s just another way for people to troll and make people wait but if there’s a legit way of staging yourself. Or make it so if you and your opponent are staging younjave 15 seconds from the time he pre-stages to roll up. Just to make it more appealing to us real racers. Just my 2 cents. But id really like to see a 2step launch control antilag some nice exhaust sounds and pops lol i think it would be awesome. I know that in conventional racing you can get an exclamation mark for drafting or allowing another car to draft you. But why am I getting nothing but exclamation marks on exp. drag? And looking at the leaderboards the vast majority of racers are getting them too. The settings on my cars are identical to what I am racing on circuits with and getting clean laps so it's NOT my settings. What are most of us doing wrong? Question: Is the countdown length at the start of a race the same every time? If so I feel that some form of variance should be added so that there’s a greater challenge to nailing a “perfect” reaction time. With a preset countdown length the start sequence becomes more about prediction than reaction in my opinion. Side note: I hope this means that jump starts (and associated penalties) will become an option for circuit races in the future. IRL, once you’re staged, the tree falls at the same rate every time. So having variation is unrealistic. Race again and Restart are my very most wanted functions in Forza series so far, so if you are going to add them globaly to all events in FM7 (and FH4 too), I'll be happiest Forza player in the world. Drag and Meetups are not my cup of tea, so I'am not going to coment them. I would like to race against different people and against different models not the same ones over repeatedly. Like the new mode! Like that you have a tree, can jump the start, all that good stuff! Something that needs to be improved is the replay of the finish line. This has been a problem since Forza 1 where as soon as you hit the finish line, the replay rewinds to the beginning. No way to examine or slo-mo photo finishes or just bask in the glory of a close win! The cars should be allowed to pass through the finish line so we can see the climax to the race. Also, in this mode especially, a side-view finish line camera is a must! Thanks for continually improving the game! God bless! Awesome! Stoked that this update was released, great job so far! I think the pause between each light should be exactly the same. 3) There should be an option for not adding reaction time to total time. Reaction time doesn't matter if your going for the Fastest ET. 4) Launch Control option would be sick! Like if you could hold the handbrake button & the gas to engauge launch control/trans brake or something like that & allow us to adjust/set the rpm. Some boost building fun w/ plenty of loud backfires! 5) Test & Tune option would be extremely useful. Have the track to yourself with the ability to tune & add upgrades. I'm sure you already have other tracks in the works so I'll leave that out for now. Thanks & keep up the great work! That's not true. Different tracks/classes/events use 2 types of trees. I believe a "pro tree" has the time between staged and green are always a little different. That way it's not a matter of getting the rhythm of that particular tree and always launching the same. You actually have to watch and react, not guess. There is also a static, constant interval tree. I'm tired and I not up to looking up the "proper" terms for each of these. I just know that in the really real world, the trees are not always lit at a constant interval.